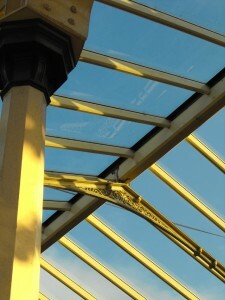 The elegant glass canopy covering Loughborough Central is one of the defining features of the Great Central Railway. 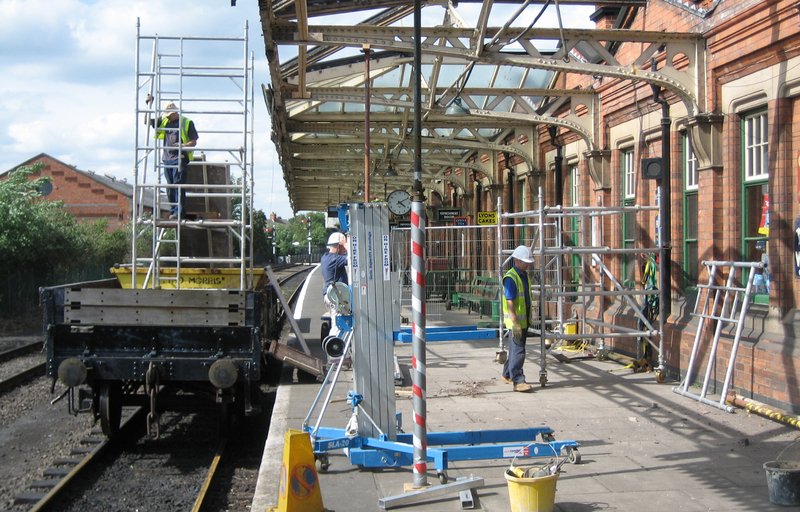 Covering platforms one and two, a circulating area - and with the addition of a further glass canopy at street level, it is also one of the biggest roofs in railway preservation; quite a challenge for our volunteers to look after. Grade two listed in the 1990s, by 2010 it was more than 110 years old and definitely looking its age. The Friends of the Great Central Main Line and the David Clarke Railway Trust launched the 'Raising the Roof' appeal seeking half a million pounds to completely overhaul the structure, to see it fit for another century of service. The job was tackled in seven sections starting in March 2010. In each section, the old glass and timber work was removed, metal work dismantled and the main supporting beams shotblasted and inspected. Off site new bits of wood were manufactured (or old components refurbished), new bits of metal were manufactured and then everything was put back together, with brand new glass being the last element. While all this was happening trains had to be kept running, and the relevant authorities on safety and heritage had to be satisfied! It was one of the most complex projects ever tackled on the preserved GCR. The last section (the north end of platform one) was completed in Summer 2013. The photographs on the page show the work at various stages. Hundreds of people supported the appeal and their names are recorded on the Canopy Roll of honour. (Not everyone wanted to be publicly recognised). Everyone at the Great Central would like to extend their grateful thanks to the following trusts and organisations who provided significant grants: The Wolfson Foundation, The Pilgrim Trust, Biffaward, Garfield Weston and The Edith Murphy Foundation. We're also grateful to many regular GCR visitors and the local community for their support for the appeal. Particular thanks are also due to Railway Vehicle Preservations Ltd who manufactured thousands of 'dagger boards' (the decorative wood work on the edge of the canopy) and the many volunteers who assisted the contractors in completing the job. 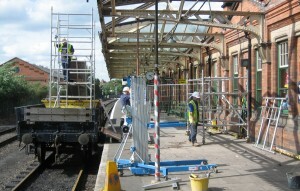 Between 2008 and 2013 many other projects were tackled on Loughborough Central station. A passenger lift was reinstated, toilet facilities improved and ramped access provided to the main station rooms. 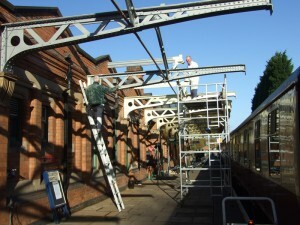 While sections of the roof were removed the opportunity was taken to rewire parts of the station, remove old cables and pipework and provide a new public address system. Cracked paving stones were repaired and levelled and the water column at the end of platform two cosmetically restored. The museum has been comprehensively refurbished and now boasts a substantial collection of exhibits from the original GCR. All of this work represents the most significant repair and upgrade work to Loughborough Central station in its long history. Above: Work in progress on the canopy. Left: A section of the restored canopy.